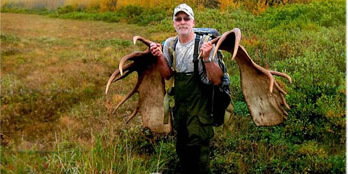 Moose hunters from all over the world have written to tell us about their hunts and how Love, Thunder and Bull in Alaska and/or the Bull Magnet® have helped them out. Following are numerous testimonials, some from as far back as the mid 90’s. Most are from Alaska, but there are also many others from Wyoming, Idaho, Utah, New Hampshire, Maine, Canada and more. Hi Wayne. I Had a good year using your Bull Magnet – still using the one I got from you years ago. Ron had a good year also, catch you around Wasilla. I just wanted to thank you for your great product. I drew Washington State’s once in a lifetime Shiras moose tag this year so i purchased a bullmagnet from you this past June. We were able to call in a monster 163 6/8″ (green) net, Shiras bull into 20 yards. My caller even induced a charge from the bull, he stopped at 10 steps, turned, went 5 more yards, then piled up. You have a great product, i will highly recommend the Bull Magnet to my friends, thanks again. I purchased a bull magnet horn from you last summer after drawing an Idaho once in a life time Shiras moose tag. I’m a pretty avid hunter, but am the first to admit I didn’t know anything about moose hunting or calling. Eventually and fortunately I found your website. I followed your 3-day focused strategy with consistent calling in one location and eventually old big boy came grunting. He actually took 5 days but what I learned from your strategy was patience pays off so I stayed in the same area calling and waiting. The bull scored 145 making Boone and Crockett. It was also the most unique and special hunting experience of my life. I got to spend a week with my dad, calling moose, and eventually bagging a big’n with his help. Your information, website and bull magnet were definitely a big part of a successful hunt. Called 4 great Bulls in in two days using the Bull Magnet. This is considered a BIG Bull here in Scandinavia, we do not have Yukon size Bulls. We just ordered 3 more Bull Magnets for our friends. After enjoying my first steak from the Bull Moose I shot last week (Delicious), I thought I would let you know how the hunt ended up. It was a much tougher hunt than anticipated, the Elk and Deer seasons coincide with the Moose hunt so you have to share the public lands with alot of other sportsman in the field, the wind was relentless this fall with many days blowing plus 40 MPH. 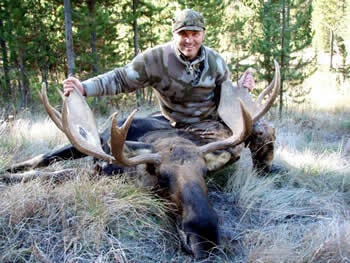 With help from your videos and call I was able to fill my once in a lifetime Shiras Bull Moose tag here in Idaho. I passed on many smaller Bulls before I decided to take this one. The Fish and Game officer that mandatory checked my bull said the average Shiras Bull Moose taken in Idaho is 34 inches wide, mine measuring in at 43 inches wide is a great bull ( The largest I had seen all season). It was an adventure I will not soon forget. He was taken at 7:30 AM, November 18th 2011. Five days before the end of the season. Wayne, I purchased one of your Bull Magnet calls this year prior to a DIY in unit 20A. I successfully called in two bulls within 50 and 75 yards respectively. The first measured 55 inches and the second was 66 inches. Just wanted to let you know what a great product you have. Here is a picture of my 66 inch bull. Wayne, I want to thank you. I bought a Bull Magnet and on the 19th of this month, called in and shot my first moose right here in Big Lake, Alaska. It had 3 brow tines on one side and four on the other. Thank you again. I’m glad to hear you are getting good use of your stick and flashlight. The help along with the call and video have been very helpful. I called this 60″ in for my buddy on our last trip. Not sure if I had sent this to you or not but wanted you to see what we were able to do with your advise and call. Thanks for staying in touch! Just wanted to send you a picture from my 4th day ever hunting moose, on drop camp hunt. Using your call I was able to call this bull in by myself on 9/14, using brush thrashing, bull grunts and a few cow calls. Hi, I was the moose hunting freak from Denmark who bought a Bull Magnet from you.Just want to let you know that it WORKS very well. I called in 4 big bulls in one day and one big bull moose, I guess 1300lb even came sneaking up from behind and I did not see it or hear it until it was 50 feet behind me. A really dangerous situation I had put my self in. But it was very windy that day. I am very pleased with the bull magnet, thanks. Attached are a couple of photos of the 68″ Moose I shot this September in the Wood TikChik using the Bull Magnet on a DIY hunt. Your videos were very helpful & provided a wealth of information. Thanks again for putting together a great product. 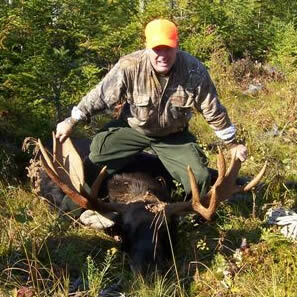 Hello Wayne – Purchased your videos and call in 2008 in preparation for a do it yourself moose hunt that fall. I am lucky enough to have a hunting buddy whose cousin lives in Alaska and has his own float plane and had him drop us off, used your strategies and call techniques to success and killed him on last day of the hunt. Will recommend others to do so as well, or use your services if they are looking for a guided hunt. Thanks for the bull magnet, it worked like a charm. I called a nice 48′ bul to within 75 yds. and sealed the deal. Here are a few photos. Thanks for the trust, Dan. Hello, i just wanted to write and tell you how well “the moose magnet” worked for me. I am from kenora ontario, i am a bush pilot/guide. i work for River Air/Halley’s camps. i guided two hunts last season, first was archery in september then the rifle in october. i called a 57″ bull from about 2 miles right to us! i just orderd another magnet for one of my friends. Just wanted to let you know how much I have enjoyed the bull magnet. Used it the last three years and harvested three great bulls. We used it so much that it needed replacement for this year’s hunt (just ordered it). Attached you will find some pictures of the Moose I got in Maine this year. He was shot on September 24, 2008 at 8:30 AM in Amity, Maine. It dressed out at 854 lbs, 14 points, 48 inch beam, 94 inch spread. Shot 1/4 mile in the woods and took 3-1/2 hours to drag out with a 4-wheeler. He was taken with 2 shots from a 30-06, 180 Gr. bullet. The weather was great all week. The rut didn’t appear to start until Sept 23. I called often on the 9/21 and 9/22 using Bull grunts and Cow calls but only had 1 response late in the afternoon of the 22nd. On the 9/23 the Bulls were answering often but would not come very close to the call. On the morning of 9/24 I had 6 different Bulls come to my Cow calls from daylight until 8:30 AM. I had 2 Bulls come back twice to my calling. At 8:30 AM this Bull was called into an open area using a Cow call.The rest is history. Everyone here in Maine that I have shown your Moose Magnet Call and Videos to have been very impressed. I think I must have the only made in Alaska Moose Call in the State of Maine. I have watched your videos quite a few times myself. I never get tired of seeing them. Thanks for the note on shipping. After twelve years of applying for my once in a lifetime Bull moose tag here in Idaho, I drew it, and thought i would buy the best call out there. I cant wait to get it here and start driving the wife crazy practicing with it. 2012 Bear hunt looks tempting. I will be in touch shortly. I will send pis of my Bull. A buddy of mine drew the tag in 2010. He used your call during the hunt. 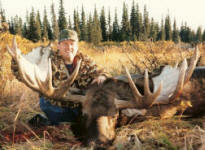 He shot a 44 inch wide Shiras moose. Respectable around here but I saw a BRUTE in the 50 plus category that I will be pursuing in September. Thank you. I have to thank you for a quality product.I purchased your Moose Magnet this past summer and watched your DVDs on moose calling.I am pleased to say it worked as well as you said..I was able to harvest a 56in bull after 1 day of calling. My name is Jon Carman. I live in Ione Washington. I would like to tell you a little bit about myself. I am an avid outdoors enthusiast. Hunting is not just a hobby of mine it is a passion that occupies most of my time when I am not working or caring for my family. I learned to hunt, fish and enjoy the outdoors from my father. He always took the time to teach his children a love for the outdoors and has always been a role model for me. I have always thought I would love to be a hunting guide as a full time profession but that has not been an option I have been able to pursue to date. 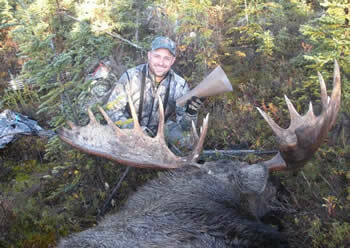 In 2008 I purchased one of your outfitter moose calls after being contacted by a friend of mine. This friend told me he had an acquaintance that had drawn a moose tag for the game management area where I live. In Washington State If you are lucky enough to draw moose tag it is a once in a life time opportunity no mater if you kill a moose or not. At least 1,000 moose are estimated to live in Washington State. Almost all are in the northeastern counties of Pend Oreille, Stevens, and Spokane. Occasionally moose are spotted in the northwestern and north-central counties of Whatcom, Okanogan, and Ferry, and a wanderer or two has been seen in other areas. But the only significant populations are in the northeast’s Selkirk Mountains that range into Idaho and British Columbia. For that reason my friend requested I assist his friend that had the moose tag because he know I had hunted the area extensively. Well I agreed to help his friend as I had never had the opportunity to hunt for moose but I had ran into them often while in the woods. After making contact with my moose hunter he informed me the worked with a guy that also drew a moos tag for the same area and asked me if I could help this person as well. Well I can honestly say that for the first time in my life I became nervous about my ability to successfully harvest an animal. The reason for this was I had not experience in hunting moose. If You asked me to help you hunt a Deer, Elk, Bear, or anything else I would not have broke a sweat. That said I was now responsible for two guys that were depending on me to help them be successful for a once in a lifetime hunt for a Washington State moose. Like I said above I started searching the internet looking for tips on hunting moose. After reading everything I could I started looking for moose calls. When I found your moose call on eBay I bought it because quite frankly it was he best call I had seen anywhere. The real bonus was when I also got your moose hunting DVDs. 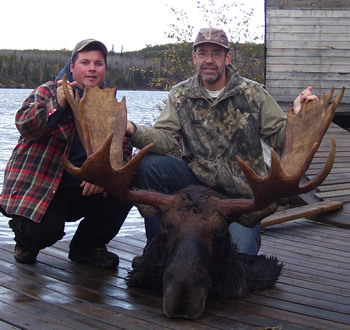 I thought I would be able to pick out some ideas that would help me guide my moose hunters. As it turned out the combination of your moose call and DVDs was the best thing I ever did. Your DVDs were full of how to tips and moose behaviors that helped boost my confidence. Prior to my moose hunters starting their hunts myself and a friend had about 1.5 months to scout for moose. during that time be burned up about $1000.00 dollars in gas and countless hours in the woods scouting for moose and moose sign. Pend Oreille County Washington where I live is very ruff and rugged terrain. 75% of the county is national forest land that is heavily forested and mountainous. While scouting for moose I ran into another moose hunter that had never hunted in my area and asked for my assistance. I advised this hunter that I was already helping two other hunters but I took his name and phone number long story short with the help of your call and DVDs I helped all three hunters harvest their moose. By following your tips and using your call I was able to call in Moose everyday during the first 10 days of the moose season I called in 12 bull moose and saw countless cows. I were able to harvest a 52 inch, 43.5 inch and a 38 inch dual drop tine. 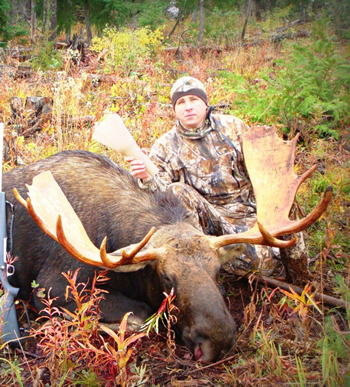 These were all great bulls for this area and the first two were exceptional for Shira’s Moose. Thanks again for making a great product that helped make my first hunting guiding experience wonderful. 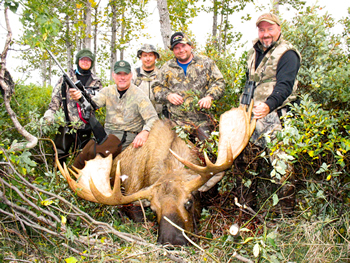 These big Alaska moose were harvested using strategies found in Love, Thunder and Bull in Alaska, the Bull Magnet®, or both. I am sure that the production of your products – videos and Bull Magnet®” – was economically motivated …, but I hope that you too take pride in the fact that you are producing the very best. I have read everything/watched every video related to Moose hunting in the past 2 years and nothing/no one comes close to providing the kind of valuable (and life-saving) information you do. Thanks for your professionalism and the attitude and expertise that you share through these tools for hunters. You (your information) is the single most important contributor to my decision to come to AK and Moose hunt. Without your help, I would have never considered it, been prepared or would have probably been killed. Hi Wayne:I hope this finds all well with you and yours. I have just returned from GMU 20E Mooseless. I spent 9 months planning a “do it yourself” Moose hunt and I am corresponding to let you know that your two videos and “the Bull Magnet” were the most important elements of my trip. While I had to deal with hundreds of logistical issues to have a successful trip, your help (videos) kept everything focused and the Bull Magnet brought in lots of moose. I can’t thank you enough for the value you provided to me and the wonderful hunting trip we experienced. I spent a lot of time doing research on moose hunting and money buying books, other videos, etc… and I have some advice to give someone starting out – it is to forget all the other stuff and get your videos (and of course the Bull Magnet). In closing, I again would like to offer you my sincerest thanks for your major contribution for the trip of a lifetime! Thanks for your prompt service in sending me your call and videos. The cd’s were fantastic and will definitely help me in improving my moose hunting skills. The call is light and robust and I look forward to using it to its full potential as witnessed in the video…. Thanks again to Your self and Wife! I just watched your “Love, Thunder, & Bull”, video for about the fiftieth time. Love it! …. Thank you for your time and the instruction. 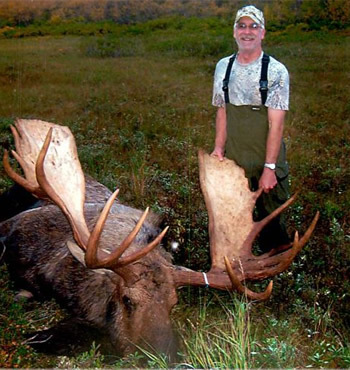 Dear Wayne,I have been wanting to write to you about my ’06 moose hunt on the Kenai Peninsula……. Short version. Called evening of opening day and morning of next day. On evening of second day, after I got into my tree and settled down for 15 minutes, I gave my first call. Bingo! A small bull popped up about 75 yards from me. As you say, patience in the name of the game. On the Kenai, we have antler restrictions so I wanted him closer to see his rack since the area was really brushy. When he got to about 40 yards, I could see he was not legal. So I continued to call, as a way to determine if my calling was on par or worthless. I pointed the call in a direction opposite from him. Still working the same calling pattern you describe. Eventually, he circled my tree, letting out soft grunts looking for his sweetheart to be. Then, he wandered off. When he got back to about 75 to 100 yards away, I let out a 1 minute long cow call. It stopped him in his tracks. Eventually he returned and circled my tree again! So, it proved to me that your calling sequence and methodology is successful. I have video footage of him near me that I shot with my digital camera that I could share with you. Three weekends later, back in the field I follow your plan. Again, on the third calling session, which was a morning, up pops a 53″ bull at about 125 yards away after the very first call. He started raking brush. He had really wierd antlers but at the right angle I saw that he was legal and now the freezer is full!………..
Just wanted to tell you how satisfied I am with the two videos and call that I ordered from you. If I would have had your info, the two bulls I called in last fall in Ontario, would have been harvested. Just couldn’t get the shot I needed, but I think that long long drawn out cow call you use could have done it for me. We also had a bull that just sat back in the bush thrashing but wouldn’t show. I’ll be ready when I go on next fall’s hunt. I just got back from Wildman Lodge, 7 weeks of guiding hunters. The old Bull Magnet brought in a nice 67 in moose. I had to stop a wounded charging bear at 9 feet, that got the blood pumping. Other than that it was a good season. Hello Mr… Wayne Kubat,I wanted to write you a brief email to say thank you. I live in Fairbanks and last year I went Moose Hunting for the first time with a bow. I was not even able to get close to a cow Moose. So after the end of the season I was able to find a copy of your video: Love, Thunder & Bull II. After watching your video I also purchased a Bull Magnet. I have watched your video a quite a few times during the off season. Then Moose season started. Bear in mind where I am hunting the Moose are not very vocal. After a few days I brought out my Bull Magnet. Everyone has been telling me it’s too early to get a response yet. Well last night I called exactly like you state in your video. I started with a long cow call, I did some brush thrashing and bull grunts. I waited 15 min. between calling sets (just like your video recommends). And I finished with a long cow call. This morning I was walking into my set up as quietly as I could when I seen the biggest Moose I have ever seen in this area. 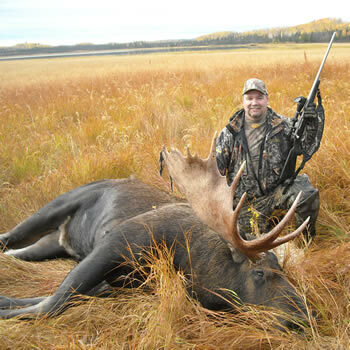 The Moose in the area I hunt are historically small. This one was a 60″+, and he was only 74 yards away. Unfortunately that is still out of bow range but it certainly showed how effective the Bull Magnet is. And now I have even more confidence in The Bull Magnet. So you can bet tonight I will be using my Bull Magnet to do some calling. Then tomorrow morning I hope to be bagging that 60″+ Bull. Wayne,My husband and I have watched the two Love, Thunder, & Bull videos many, many times and thoroughly enjoy them. It is nice to have some quality moose hunting videos on the market. 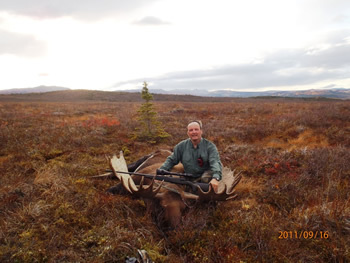 I wanted to thank you and your wife for the quality information on your video tapes and the Bull Magnet® which I used to call in and harvest this nice 57 inch bull on my first Alaska hunt. The information and sounds on the video were exactly as I experienced in the field. It was amazing to see this guy coming in shaking his head! Thanks for your help. I need to order 4 Bull Magnet®s. I am at a remote lodge in Alaska and need them ASAP. I use one of your calls, They work great (will send some pictures) I am getting these for my other guides, they have seen mine and watched your tapes and all want one. Thank you again for getting these out to me. Hi Wayne, I recently viewed your video LT&B 2, WOW, without a doubt the best moose hunting video I’ve seen, great calling tips. Truly enjoyed all the moose scenes. Keep up the good work, am looking forward to LT&B3. Look forward to getting your new video. Used the instruction from the LT&B1 video last year, plus the “Bull Magnet®” to call in and bag a nice bull last year in Unit 17B. The Bull Magnet® really works and is easy to use. A very good product. I apologize that I am sending this so late but I wanted to send you my testimony for your products. 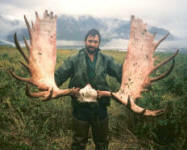 I was in Alaska last fall and managed to call in a 62 Inch Bull from ¾ mile away with your call. I also purchased your tapes and practiced before coming up and I truly believe that is the reason I was so fortunate. I called in 3 different bulls during our hunt and all of them traveled over a ½ mile to get to us. We hunted an Alpine area so we could see them coming from a long way off. For a guy from Missouri who has never hunted in Alaska before this was some kind of experience. Your products work and that Moose would not be on my wall without your tapes and call. Keep up the good work. We received the tape & the Bull Magnet® in the mail yesterday and after watching the tape a couple of times & practicing a bit, we decided to run out to the Swanson River Oilfield for a trial run! WOW! It was almost too late to hunt, but we saw a lone cow in a large field – I decided to mess with her a bit. Sitting in the truck I gave a few grunts & some cow calls ( we heard some in the distance earlier) She was all intrigued & interested & came closer. Then – within 5 mins. of calling, another cow appeared – within 30 minutes there were 5 cows & 2 Bulls! One was a fork & hid out in the brush – the other was a Monster , but it was too dark to see how many brow tines he had! We camped there overnight and I started calling before sunrise! Sure enough they came back! Sadly – the sun was in the scope & the Bull was in the brush. We still couldn’t get a good look at the rack! So we bought a spotting scope! to be continued……. P.S. The Bull Magnet® Works! I never had so much fun! Last August I ordered your Love Thunder & Bull Video. Upon receiving it I did watch it & practiced those bull moose calling sounds for a full 2-1/2 weeks, before going archery hunting. On the third day out, I was calling on a windy morning and could hear a bull responding, somewhere within several hundred yards. I couldn’t locate him. After an hour or so, I headed back to camp about 2 miles away and left the thick willow and got into the timber. What I walked upon I thought was a large bull elk thrashing some small pine trees, it turned out to be a large bull moose. He was the one calling back to me. After about an hour of stalking and watching him, what seemed like half a day, I got to within 18 yards broadside and arrowed him with my recurve bow. Man, what an exciting time, calling and getting the response from him that way. Now after taking him and packing everything out on my horse – 3 trips, I will shoot him with my camera now. Thank you so very much for your production tape, it was great. I will watch your video before every hunting season now. I just wanted to let you know after watching your video, I called in a bull moose to about 20 yards. 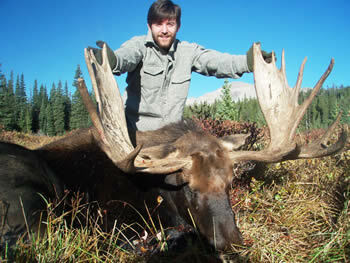 I shot the moose during the second rifle season by Walden, Colorado. Thank you for all the information. p.s. the Bull Magnet® called in a total of four bulls in two half days of scouting and opening day…this bull swaggered in after a long drawn out cow call and some previous raking with the call on some willow brush…thanks again! I had ordered your tapes and call awhile ago and wanted to show you the results of my “once in a life time” Minnesota hunt. 38 1/2 inches, 1000 lbs. Good enough for me. Thank you very much for the excellent call and very informative videos. Received the moose call today. No damage and I like the tone it gives. I am very pleased and intend to put it to good use. Thanks for every thing and I wish you all the best. Included is a check for $40 for one “Bull Magnet®”. Boy! are your videos good! Not only is calling well presented, but so is strategy of establishing lookouts & calling sites. Great Work! Please keep me informed on any future videos or hunting accessories. etc. Hi, I watched your moose video, Love Thunder & Bull 2 video. This was one of the best moose videos I have seen. 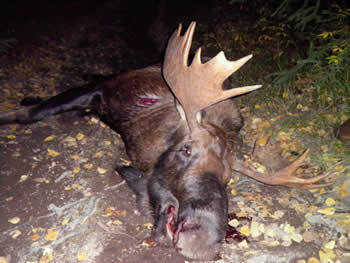 Could you please send information on your moose videos & the prices if possible. Thanks. Enclosed is a check for $40.00 for 1 Bull Magnet® Moose Call. Thank you for such good service. My wife & I enjoyed the Love Thunder & Bull Videos and are looking forward to future releases. Wayne does a terrific job showing how to make the vocal sounds. It was nice talking to you on the phone. I received your videos and moose call. I’ll be putting it to good use in Ontario in Sept.. I’ve looked at the videos several times and they are what you said they are, very informative with a lot of action. I have enjoyed watching your video Love, Thunder & Bull 2. 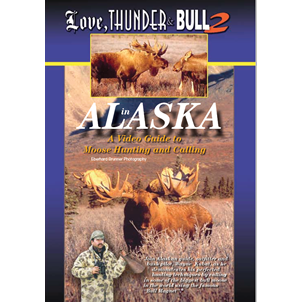 It is full of useful information for a first time moose hunter. I would like to order a Bull Magnet®. I have enclosed a check for the call. Again great movie and thanks for the calling tips. I am now properly equipped for my late September moose hunt in Newfoundland. Thanks to your Bull Magnet®. I enjoyed your video and have passed it to a friend, who also is going moose hunting. Thanks for the video “Love Thunder & Bull 2”. It was great! When you release the video on caping and butchering moose, will you please inform me! Thanks. Thanks for your note and prompt delivery of the Bull Magnet®. I have another one that my hunting partner and I bought at retail in Fairbanks, Alaska, but it is packed with our gear and stored in Alaska. I also have both of your videos that I show my friends when we get pumped up about moose hunting! 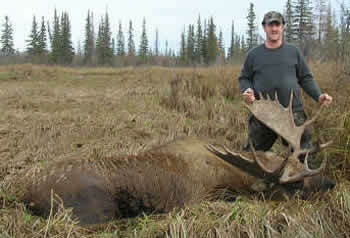 We have hunted moose in Ontario, Newfoundland and Alaska. For the last six years we hunted drop camps in Alaska – tough hunts, but beautiful country and we took some very big moose (60, 64, 67 inch. etc). I needed this moose call because I am going with a group of hunters in Sept. to very Northern Ontario. I’m not going to hunt (Don’t like Canada gun laws!) But I’ve offered to help a hunter or two in calling, tracking, scounting etc. These guys are from Oregon and I don’t know if they’ve seen a Bull Magnet®, but they’ll get a Demonstration! Next year, when I retire, I plan on visiting and maybe hunting in Alaska again – might stop and visit your operation at Alaska Remote! 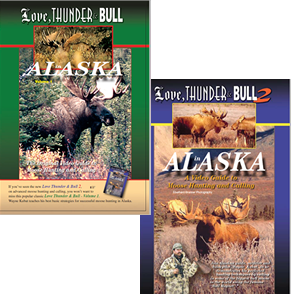 Just wanted to let you know, I purchased your 1st video Love Thunder & Bull 1 in 1998 just prior to going on a moose/caribou float trip. 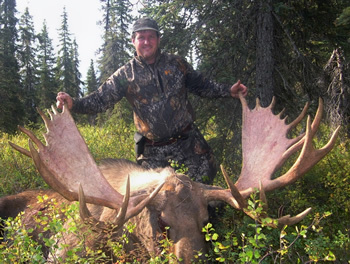 My partner and I each killed 2 nice caribou bulls and I got a 50″ moose. The moose I got was called in using the methods learned from watching your tape, as were several other moose on the float. At the end of our float we caught up to some other hunters who were trying unsuccessfully, to call a bull down river to them. After they gave up, I called several times and flashed the antlers from my bull and brought the small bull up to directly across from camp. I think several of the other group probably went home and ordered your tape! Thanks for helping to make a very enjoyable and successful hunt. Enclosed please find a check for $29 for Love Thunder & Bull 2. My hunting partner purchased the first video which we watched several times before our last hunt. We were hunting unguided out of Kotzebue, Alaska. We both killed good bulls 62″ & 58″. We shot them both from camp & both within 50 yards of the lake. We had been making “moose noises” to imitate your video. After we shot & cleaned them & while waiting for our pickup, we had 2 more racked bulls come in near our camp, one within 35 yards. I have no doubt why these bulls came into us, & I would like some more education. I look forward to viewing your new video. Myself and a couple of friends went moose hunting for the first time last fall. While shopping for hunting supplies we ran across one of your Bull Magnets, and not knowing anything about moose hunting, decided to pick one up as it wouldn’t hurt our chances of bagging a moose. Well like I said, we didn’t know anything about moose hunting, so when we finally arrived at our drop point we set up camp and I decided to start calling for moose. It was about three days later that moose started showing up and responding to the call. We not only bagged one but both of us bagged a moose that season. This year I’m ordering your videos so I’ll know how to properly call a moose and hopefully bag a much larger moose this season, the whole hunting trip was a blast and thanks to the Bull Magnet® and a very successful hunt. 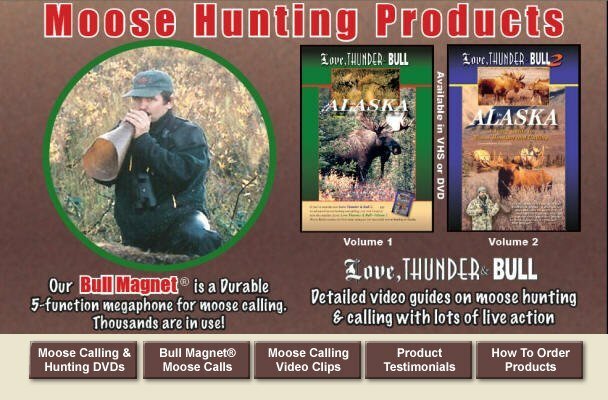 Wayne, I purchased a Bull Magnet® and the Love Thunder and Bull 1 & 2 videos last summer. I went on a self Moose hunt on the Chatanika River near Fairbanks in Sept. I spotted a good Bull one morning crossing the river about a 1/4 mile below me, so I started after him. I could stop him with the call but the brush was so thick I couldn’t get a shot, when I would stop calling he would walk away and each time I grunted or rubbed on a tree he would stop and start rubbing brush. This kept on until he had me probably 300 yards from the river and since we would have to carry out the meat I let him go. The next morning I hunted the same area and at about 6:45 am I spotted the same bull walking through the bush about a 100 yards paralleling my position. I started rubbing and grunting after about 10 minutes and a lot of brush thrashing on his part I called him in to a clearing about 60 yards from me. One shot from my 30-06 and he was down. I was going to shoot him again, but by the time I worked the bolt back the moose had fallen. The antler spread was 53 1/2 inches. Just wanted to let you know what a great call your Bull Magnet is. I purchased one in the summer of 2000 and called in 9 different bulls on an Alaska hunt that same year (nothing that I wanted to shoot.) 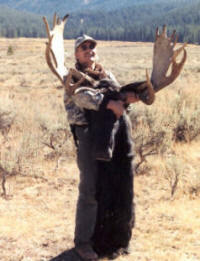 In 2001 I called in a couple of nice bulls before settling on a real high 55″ bull with 24 points. 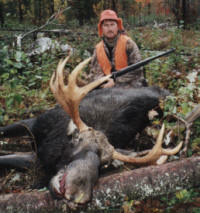 In 2002 I hunted north western Ontario for moose. Unfortunately I was involved in a boating accident the first day of the hunt and lost my Bull Magnet® (along with most of my other gear) in 104′ of water when the canoe tipped over. Needless to say I now need a new call. I am sending you an order for the call with a check for $42.00. I am still booking hunts for my clients (and myself) in Alaska and the next time that I am up your way I’ll try to look you up. Hope you had a great hunting season. Your videos were very instrumental in my deciding to relocate to Alaska six years ago. For that I will be forever grateful and partially in your debt. I told my friends that I finally met Wayne Kubat! (and of course Marilyn). I think you’ve had more influence on my life as a hunting adult than Superman did on me as a kid! I would be thrilled to promote and sell the videos on my site. 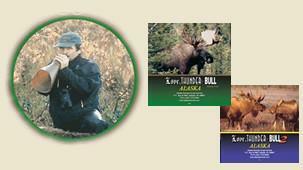 Just bought both your Moose hunting tapes -GREAT instructional tapes!!! I’ve read a couple books regarding Moose hunting and calling, but the tapes explained and showed first hand how to do it! Thank you!! I leave for my first Moose hunt in your gorgeous state on Sept. 2nd and know I need two of your “Mega-phones” (sorry, don’t remember the proper name), one for myself and one for the other two in the group of four. I like how you can call, scrape, rake, and amplify your hearing with it. Thanks so much! Again, my family loved the videos! Thanks for getting the videos and Bull Magnet® to me so soon after you had the latest video finished. I viewed #2 first as you suggested and found it to be all I had hoped for. The moose footage is outstanding. While I am certainly not in any hurry for summer to end, I am anxious to put the strategies and techniques demonstrated in the tape into practice as this moose season approaches. I can see that not following your basic tenant, patience, may have been why some of my past calling attempts were unsuccessful. I really like the music too. After viewing tape#1 last night, I think the two tapes compliment one another. I was impressed with how close you called some of the moose and I of course appreciated the large bull taken by a bowhunter. I agree that #2 is much more inclusive and offers the hunter much more, but for basic moose calling instruction, I think either can stand alone. I will be viewing each one several more times prior to and during moose season. Virtually all of my moose hunting in 32 seasons in Alaska has been on the road system in Units 14-A and 15. I have always walked from my house or driven a highway vehicle and walked in. Consequently I have had few opportunities to hunt large bulls. The areas I hunt are heavily wooded and I usually still hunt though I have spent some time in tree stands in recent years. Calling has always intrigued me as a possible way to improve my hunting. This may be the year. 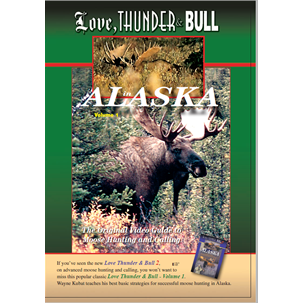 Hi there, I just saw your video Love, Thunder & Bull 2 in Alaska yesterday and I wanted to drop you a line to tell you how great I thought it was! I found it extremely informative and plan to try some of your techniques the next time I’m out hunting moose! I just wanted to give you an update on our moose hunting. The area we drew our moose tag here in Idaho was not the greatest for holding large amounts of moose and most of the moose we did see were branch antlered bulls (no palms), they looked more like elk antlers than moose. I just wanted to write to you and thank you for the help your videos, calling techniques and Bull Magnet® helped us. Towards the end of Sept. is when we were concentrating on our moose hunt since we had decided to only take a moose with archery equipment we were trying to get in on the beginning of the rut before the general rifle season started. Our plan worked out well since we hit the beginning of rut pretty well. 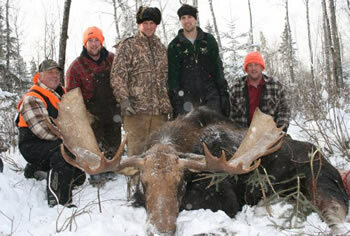 In a 3 day period we called in 4 Bull moose to bow range. My wife and I had been glassing a lake on a late evening hunt since I had shot a deer earlier that day our evening hunt was limited. I wanted to go check out a small pond below this lake where we had heard a cow and calf had been hanging out. As we were moving around the lake towards the lower pond I looked across the lake just as a nice bull was coming to the shore. After a quick glance through my binoculars I saw my first moose that actually looked like a moose. He had palms on each side and appeared to have a good spread. I told my wife that was the moose and if we could get into position I would take this one. We ran back the way we had come to get behind a dike that served as the lakes dam. My wife climbed to the middle of this dike and eased up to the top where she could see the bull. I kept moving to the end of the dike looking for a place to set up. Before I was ready my wife called to the bull. Using your fiberglass call she let out a long cow call. She had seen that the bull was beginning to move back into the timber and had called to try and draw him back, even though I was not ready and couldn’t see the bull I figured I had better make due with what ever setup I could arrange where I was, so I setup in front of a small buck brush. I had a good opening in the trees to the shore of the lake and estimated I would have a 30 yard shot if the bull came along the shore of the lake. In my haste to setup when my wife began calling, I had not noticed a dead branch sticking up which I ran pell mell into causing it to snap (or rather explode). Within moments I could see movement through the trees along the shore of the lake. “He’s coming I excitedly thought”. Just before he entered my opening in the trees I came to full draw on my Mathews bow, but to my horror the bull stepped into my opening facing me, giving me no shot and a slight shudder wondering what was going on in that bulls head. Lucky for me my wife also saw him turn in my direction and she called again to the bull. The bull turned and again began walking towards the sound of the cow my wife was so elegantly imitating. He was again behind trees and I slowly followed his movements with my sights knowing that the shore he was walking along met with the dike only a scant few yards farther where he would be within 22 yards and at a good broadside passion. Everything went as hoped and as he stepped up to the dike he stopped, My site pin found the spot I wanted behind his shoulder and the arrow was away driving deep into his side. Needless to say my wife decided with a huge bull moose barreling down the dike towards her she had better get out of the way so she snatched up her bow and gear and quickly shuffled down the dike and into bushes at the bottom. The bull ran within two feet of where she had been sitting as it ran down the dike of the lake. We recovered the bull and I have included a picture in this e-mail. I have not had him scored yet but I am told he has the average spread of a Idaho Moose at 36″ he is a 8×9. In my eyes he is a true trophy. Thanks for helping us be successful in this once in a lifetime effort here in Idaho. 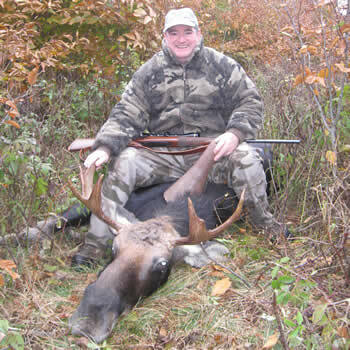 I recently purchased your moose call for my moose hunt in Maine. I am a guide in Maine and have used many different moose calls. I am sure I am not the first to tell you, but your call works great! Early on the second morning after passing up several small bulls on opening day, I started with a long cow call in an area where I knew there were big bulls. I followed it with two bull calls, waited a couple of minutes and was about to move along when I heard it, that distinct low grunt in the distance. I called again and that was all it took, the bull was on his way thrashing everything on his way. A couple of minutes later after closing in on me from well over two hundred yards, was a great bull for Maine – 54 inches and 950 pounds with 19 countable points. I shot him with my 270 and he only ran 20 yards, what a great hunt. I only have you to thank. Thank you so much for contacting me about your Call, it works great. Hello. Last year I ordered a bull magent from you and let me tell you it worked. 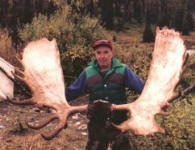 I was able to call in a bull moose during the 2001 Maine moose hunt using a cow call and your bull magnent. I ended up giving this call to another hunter who helped me get the moose out of the woods. I am not sure if you remember me, but I bought a call and tapes from you about 6 months ago. I am from Rochester MN. Well I shot a moose. Not a huge one, but average for Minnesota. What is even more nuts is the guy that bought a call from you also a year prior (Jim Brand) , helped me out a bunch so I took him goose hunting today, because the late season Canadian goose season opened today and we pounded them also!! 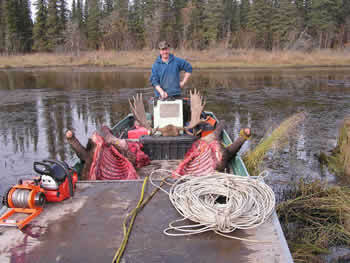 Good hunting, this coming fall is Alaskan moose now! I have already warned my girlfriend that I will be coming to Alaska. Wayne, I have your “Love, Thunder & Bull 2” video, and have enjoyed it a lot and learned a lot from it. I saw your moose call on the internet and am very interested in purchasing one, but I need to get it asap. Can you help? My name is Tom Healey. I bought the Love, Thunder, and Bull video with the Moose Magnet from you guys back in 1995. Since then I’m 2 for 2 in moose hunts in New Hampshire. The video and Moose Magnet were great. Both times I’ve hunted with your call, I’ve got bulls to come within 15-20 yards. If I ever get up to Alaska for a hunt, you’ll be the guide I call. 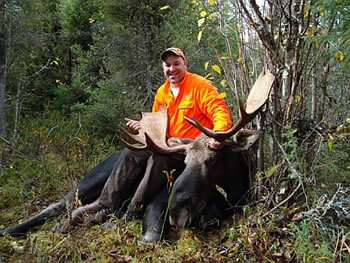 Just wanted to let you know I had a great time hunting New Hampshire Moose this year with the Bull Magnet®. We found that moose responded vocally often (both cows and bulls). We found that most often when we saw moose (23 moose during a 4 day hunt), it was in an area we had called in. “Thunder 2” provided us all the calling instruction we need for a successful hunt. We had a chance at a 50+ inch bull that caught us flatfooted. We ended up harvesting a large cow as the weather started to close in. Please accept my thanks for sending the “magnet” and waiting for my check. Please feel free to use me as a reference should the need arise for vouching for your product. Perhaps someday, I’ll be up to hunt with you! This weekend I met a fellow here in New Hampshire, Phil Stearns. I am hunting moose this year with my son. He was lucky enough to draw a permit in our lottery. This will be our 4th hunt. So far we have had 100% success. He had one of your Bull Magnet® calls. Very nice and practical call. Very durable. I would like to buy two of the calls. One for me and one as a gift. I would like two of your Love Thunder and Bull 2 videos and 2 of the Love Thunder and Bull. My brother bought a Bull Magnet® two years ago from you with the video. I used the magnet last year on my Shiras moose hunt and called in several bulls. I am one believer in calling Moose. In fact I think it is more fun than bugling Elk. I just want to tell you, I was shocked how the Bull Magnet® worked. I drew a tag in Wyoming for moose. I wanted to shoot one with my bow. The first day I used it (the first 10 mins.) I had a bull darn near run me over! I missed the first arrow at 25yds, then the bull took off, I called him right back in, and shot him at 15yds. I liked your #2 video so well , that I wanted to see what I missed on #1. Here is my order.